The original Ittle Dew game came out just over two years ago, first for Ouya and PC, then for Wii U and mobile. It attracted attention because it is crafted in the classic mould of Zelda games, with A Link to the Past being closest, while at the same time dropping the epic adventure trappings in favour of something much more light-hearted. I never got to play the first Ittle Dew, but it is clear that this sequel very much follows the same approach. Related reading: Another game that is quite slavishly loyal to "the Zelda formula" is Oceanhorn, now on just about every platform imaginable. Matt's full review. Ittle Dew 2 expands and improves on the original formula: the graphics were given a 3D facelift, and a host of new content was added, both in terms of exploration and skills. 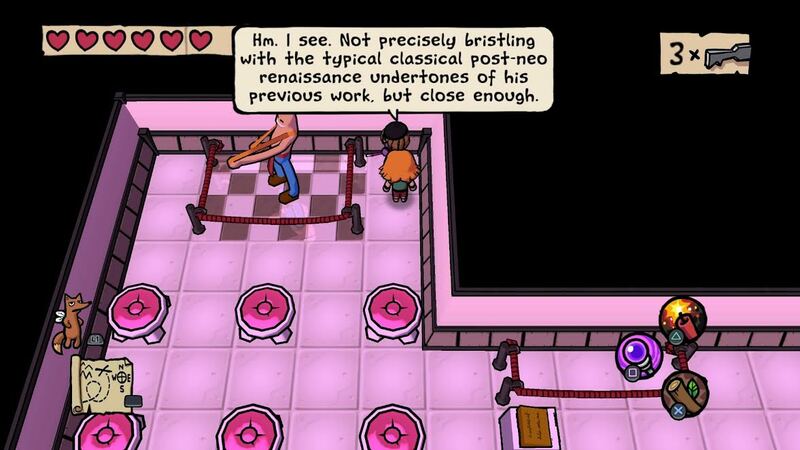 It looks like Ludosity threw everything at it to produce perhaps the definitive version of Ittle Dew. 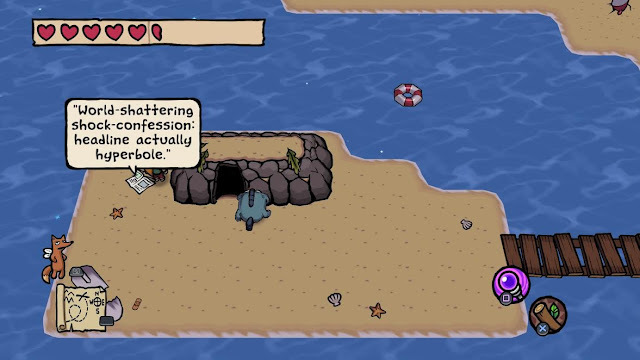 Starting up the game for the first time, you are greeted by a simple, clean and vibrant art style, cuteness of character and environment design, and a very barebones, straight-into-it storyline. Ittle’s raft gets stranded on a mysterious island and soon she and her sidekick Tippsie - a fox with (ahem) fairy wings whose job it is to offer nuggets of advice - are tasked with exploring the place in order to retrieve the eight required raft pieces to build a new one. You are lulled into thinking that this is a very ‘simple’ game, easy to breeze through in an afternoon. Oh yes … oh definitely not! You start out in Fluffy Fields, your first piece of the map, but soon you traverse Pepperpain Prairie, hope to survive the Boiling Grave dungeon, and may with luck reach The Lost World of Avlopp. The place and dungeon names are inventive and their ambience always reflects a particular theme; so Pepperpain Prairie is suitably Western-styled, and the Sweetwater Coast offers a beach complete with tents, buckets and … nasty critters like whirling candy sticks. So let’s get to the monstrous inhabitants infesting these beautiful lands. There are a lot of them. Lots of different sorts, from recognisable to weird, and almost all of them try their best to kill you as you scamper over the area map, desperate to reach the refuge of a dungeon. They will spray and hit you relentlessly with shots, or fire, with bullets that trace a looong way and oozing liquids. Your only true defense (apart from some minor upgrades later on) is one skill: the Dodge Roll. Never have I yearned more for a Link shield than in this game. Ittle Dew 2 is designed, to the hilt, as a breathless adventure, and when you’re not rolling or hitting critters, you’re facing dungeons with puzzles, mechanical devices intent on dismembering you, and hyper-charged enemies leading to the final dungeon boss who will yield that all-important raft piece upon defeat. I need to confess that I did not enjoy Ittle Dew 2 very much in the early stages. The relentless yet repetitive nature of negotiating area maps dampened my enthusiasm. Only occasionally will an enemy on the map yield some small bonus (a heart or a buff) when dispatched, so weaving around the hordes becomes a somewhat tedious exercise. I’m at heart a loot-centric player, and early on there isn’t much in the way of powerful skills or upgrades to be found. Only later, with a more diverse arsenal of skills, did my engagement with the game pick up. Once I was about half way through, that addictive phase suddenly kicked in, and I came back constantly for “just one more” puzzle or dungeon fight. And this is where I think the game has a problem: the pacing is too slow in the first few maps, probably because the content is stretched much further than in the original game (which was quite short by all accounts). Ittle Dew 2 has an incredible amount of content. Don’t let anyone tell you that this is a ‘short’ game (i.e. around 10 hours). You need to discover not only the main dungeons, but a whole raft (!) of mini-dungeons, some of which you find by testing hillsides for cracks (this is time-consuming, you only have a small stick! ), others are revealed by means of musical puzzles, and there are also mysterious towers with numbers on them for which you need the right amount of secret shards for them to open an underground dungeon. There must be well in excess of a hundred dungeons and mini-dungeons. I really wish the developers had managed to label these dungeons by name (or abbreviation) on the maps. If (more likely, when) you want to revisit a dungeon for that unsolved puzzle or boss fight, it’s a hunt-and-peck quest to locate it - unless you have a perfect photographic memory. Likewise with the warp spirals which conveniently transport you from the hub in Fluffy Fields to any area map; while you can identify them by cross-checking their location on the overmap, a simple label would remove that slight, irritating hold-up. These are minor quibbles, but they often make the difference for a smoother playing experience. The checkpoints, which double as healing stations, have however been very generously implemented, so you will quickly respawn with full health once you die (and you will die often! ); also, all progress in dungeons is saved instantly, so you never have to re-do a puzzle. 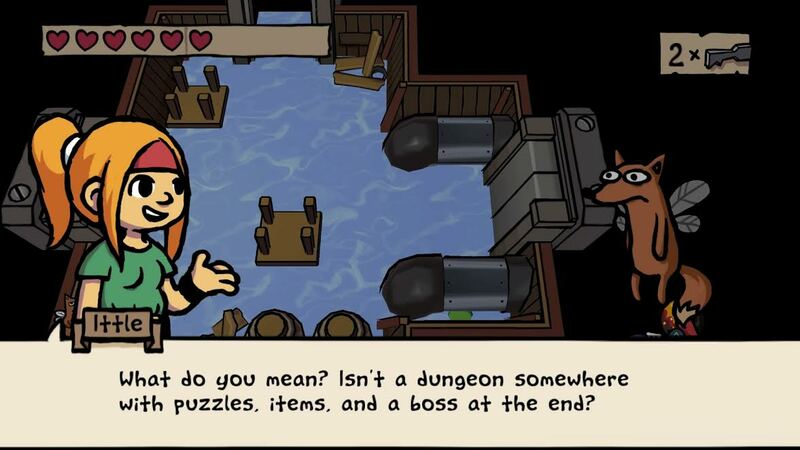 Puzzles are at the heart of Ittle Dew 2. They will give access to treasure chests with useful items and open previously locked doors. They are not overly taxing as you start out, allowing you to familiarise yourself with their special logic, i.e. which type of block has which properties etc. 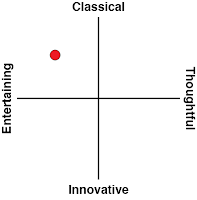 The difficulty ramps up nicely and you will be entertained - and driven to distraction - by a variety of brain teasers. They usually revolve around pushing/manipulating blocks and ‘activating’ the quirky diamond-shaped face figures that often guard doorways. For me, the puzzles are really the highlight of this game. But then, I’m happy pushing around blocks any amount of time. The puzzles are all well constructed and I particularly enjoyed that they have thematic and design cohesiveness, each puzzle augmenting your understanding of the puzzle universe, thus leading you to ever more complex tasks. I cannot be quite as effusive about the combat. This is where Ittle Dew’s insistence on keeping it simple reduces most fights to button mashing. Boss battles were also not the high point I had expected them to be based on the game's status as a giant homage to the Zelda series. The boss attack patterns all follow a similar formula: a spray of projectiles you can and must dodge roll through, and a main attack blast against which you have little defence except running like a hare, or hoping your Force wand rebuff or ice cubes will divert the barrage. The timing can be so close that I sometimes genuinely did not see why or how I did win boss fights in the end; and that can be a bit of a let-down. I did not manage to find/unlock the Ice Ring until quite late in the game, which contributed to some frustration before then over certain puzzles or enemies. 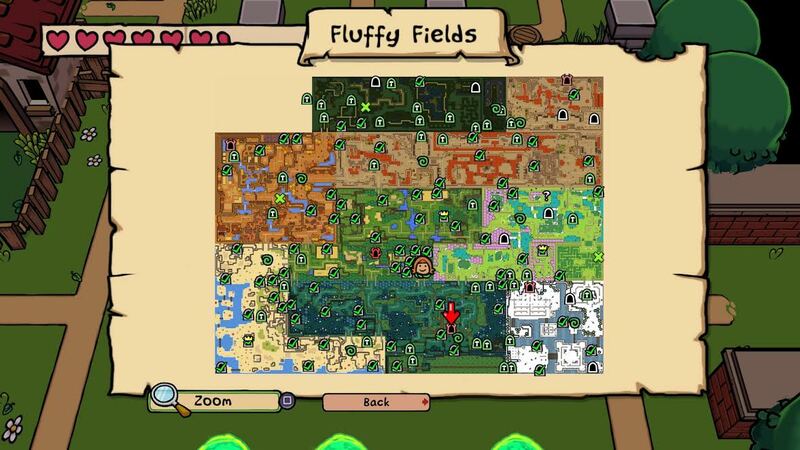 This was probably just bad luck or inattention on my part, but I mention it because it brings me to one of the distinctive features of Ittle Dew 2: you can tackle maps and dungeons in any order you find them. That sounds great, doesn’t it? Especially since we are assured that it is possible to complete any dungeon with what you have, and all you need to solve dungeon-specific tasks can be found inside that dungeon. Well, in theory this is fine, and I’m sure it’s doable - but in practice, I wish you good luck with that. I found the upgrades absolutely essential for many of the dungeons. Here paths will diverge according to personal preference: I for one would, given the choice, opt for a more streamlined approach that leads you to main weapons/skills in a more timely manner. But I know, other players love the freedom of the open-map approach. Just be aware that this open-worldness will involve additional trekking around, which - to be fair - may well lead you to discover special, separate mini areas (like The Forbidden Area). Ittle Dew 2 sports many iconic, recognisable traits from the Zelda franchise: Ittle herself looks Link-ish with her yellow hair and green outfit, and your health bar consists of hearts. The viewpoint is strictly top-down, too, and technically this is very well implemented. Where this game sets itself apart (as I mentioned in my introduction) is in the narrative style, which is determinedly humorous. From dialogue in the short cut scenes to NPC comments, from notice boards in dungeons to the bosses themselves - everything and everybody tries their hardest to be funny. And it just didn’t resonate with me. Perhaps because it was laid on with a trowel, or was often heavy-handed, or overly obvious. Some of the humour strikes me as being targeted at age-specific audiences: for instance, the Trash Cave with its smelly, rotten garbage and foul inhabitants would probably delight younger audiences, whereas the Art Gallery dungeon might appeal to adults. 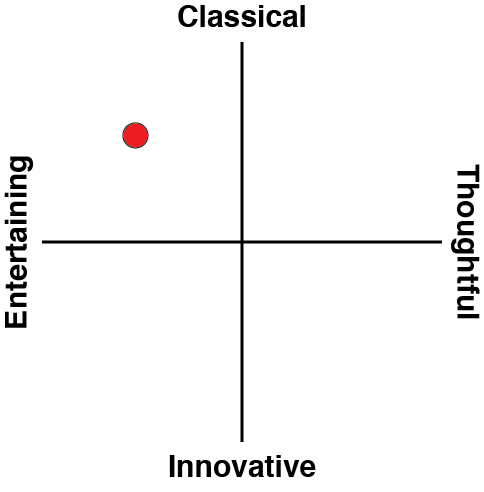 But overall, I found the attempts rather hit-or-miss and lame. Honourable mention goes to Tippsie who keeps insisting she must stock up on potions - the joke being that of course this game has no potions whatsoever! I am convinced that with a smarter, more inspired script, Ittle Dew 2 would be lifted to a different level of game. This includes the story itself, which is quite pedestrian, and crucially the two important characters, Ittle and Tippsie. I never formed any attachment to the plucky girl. She is headstrong, feisty and outspoken to the point of rudeness. Instead of me rooting for her, I saw her as a ‘constructed’ character, a carefully assembled narrative device. I went out to solve puzzles and fight enemies because of the lure of technical mastery and upgrade compulsion - not because I identified with the story and its protagonist. Related reading: Harvard shares his take on Hyper Light Drifter, which is different, but Zelda fans will love it. I went back to A Link to the Past during my time with Ittle Dew 2, to remind me of the roots and inspiration for a modern Zelda-style adventure game, and I found myself wishing I could play the classic game instead. It’s undoubtedly a hard act to stand on the shoulders of such an ancestor, and the critical light trained on any followers is of necessity harsh. 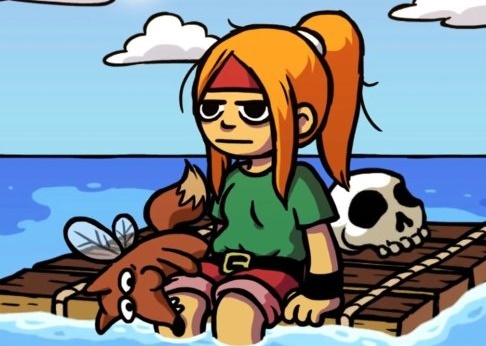 Ittle Dew 2 has many good things going for it, but I am wondering whether Ittle might thrive more now if she sets off on her raft, unencumbered by trying to be part of another franchise's tradition, to discover a new land all her own.